Since my last blog in April I’ve been a bit remiss. My planned August blog never transpired due to a mix of business and family losses – sorry! Summer proved to be fun with a number of ‘Standouts’: St Neots and Cambridge Folk Festival slots, having my songs put on a comparable level to that of the great Clive Gregson and JJ Cale by ‘Louder than War’, appearing at the Cambridge Folk Club (with the amazing Claudia McKenzie & Jody Swanborough), appearing live on the Cambridge Folk Show with Sue Marchant & Nicky Stockman, sharing the floor with the likes of Jez Lowe, Clive Gregson and Steve Tilston, playing a full electric show (thanks to Joel Mason Lead Guitar and James Burke Drums), making a video for ‘U’ from the album with the amazing Matthew Rix … I could go on! The latter part of the year has seen me explore a trio format more with my old mate Keith Hagger on Bass and Jody Swanborough on drums – more next year I think as those who know me will not be surprised to learn I’ve been writing new material, which I’d also love to record fairly soon too! There are loads of people I should thank for supporting me over the last year, thank you all. I would however like to single out Patti and Roger at St Neots Folk Club for allowing me the frequent opportunities to play my brand of folk music to visitors to the club and Festival. And also the amazingly kind and talented Stella Hensley and Chris Newman for the opportunities they have put my way (and the words in other people’s ears on my part), bless you, you are much loved. (Go see their band The Barefoot Doctors they’re fab)! Finally best wishes to you and yours for a wonderful Christmas and I hope 2019 brings you good things. See you on the other side … and yes I will get the online stuff sorted next year! Following a great Christmas and New Year the brakes were firmly put on shortly after! Like many others I succumbed to the dreaded ‘lurg’, which came and went right through to the start of April! I did manage to get in a couple of nice plays: one supporting Ninebarrow at St Neots Folk Club (and amazing they are) and also a full electric band show at the Broadway in Peterborough which was great fun. Sadly I had to pull out of a number of other opportunities to play. Made some new friends in Stella Hensley & Chris Newman, two lovely and amazing people who’ve helped with advice and some gigs too – thanks both (check them out either under names or as the ‘Barefoot Doctors’. I also renewed some old musical friendships: one with my old mate Keith Hagger and the second with fiddler Colleen Laura – playing opportunities being explored and arranged. So now the bug has departed I’m looking forward to plays at St Neots and Cambridge Folk Festivals (solo), the ‘Up the Creek Fest’ at Downham Market, a couple of local open air plays (with full electric band) locally and a support slot at St Neots Folk Club for Clive Gregson (which I’m really looking forward). I last saw this amazing singer & song writer some 25/30 years back. As for the album many thanks for the review and kind words from R n R Magazine “… wordy and thought provoking. There is a wry intelligence at work here”. And yes I know, I’m still long overdue some on-line content – I’ll get there! Although 2018 didn’t start as I’d hoped (guess I’m not as young as I was), I’m quietly content with the pace of things and happy with the important stuff, enjoying the amazing music and company of others, making friends and … playing a bit myself. Best wishes to all and enjoy your summer of music be it playing or listening. Support live music it’s good for the soul. Blimey, the year end and a year it’s been! One that started with trepidation is ending on a high. I’m flabbergasted! Production: Tony Rawson CEO Music Street, Rob Bond Boskey Recording Studio, Nev Barker CEO Confidential Records UK, Karen Klein Kenney, Tim Courtnall, Andrew Thompson at Sound Performance, Heather Birnie Photography (along with Amber Lu), Emm Rouse Graphic Design and ‘ear bending’ … and there was some! Thank you all for your advice and talents. Musicians: Rob Bond (Pedal steel), Andy Childs (Bass), Joel Waters, Mitch Field (Drums), Chas Hutchings (Trumpet & Trombone), Joel Mason (Acoustic guitar), Gareth Stuart (Bass) and Katy Watts (B/Vocal). Thank you for your musicianship and creativity. Si Dartford thanks for being the friend and peer who gave the album its first listen ‘outside of the bubble’ … phew! Released at the end of September digitally and physically, it has so far been received well. Radio, peers and friends have embraced it and I’ve been blown away by the positive feedback. It means a great deal to me. 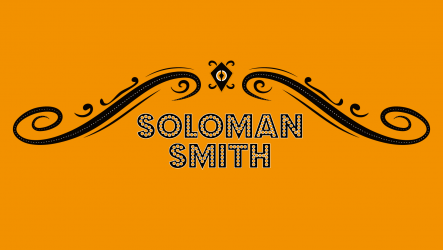 To those who remember my previous stuff your ‘leap of faith’ into the world of the more mellow Soloman Smith (a place I’m personally happier to be) is humbling. Ok I’ll still play the odd old one now and again … well maybe! I’ve played a few live shows which I’ve thoroughly enjoyed. Including a support for the amazing Jim Moray, a headline at a new songwriter session at Pepys, Huntingdon and a few support/floor spots . I’ve renewed my membership at St Neots Folk Club (Roger & Patti Pitt thanks for the welcome). Ive appeared on some Community Radio Stations. Many thanks to Doc Mason at Peterborough, Les Ray at Cambridge and Liz Kelly/Mel Tait (Huntingdon) for having me on. Muso friends old and new thank you for your generosity of spirit: the great Paul Downes (thanks for the banjo tips), Chris Fox for ‘the gas’, Christian Smith, Nick Hall (for steers) and the lovely Katie Watts for faith. I’m really looking forward to getting out and playing more live shows. Hopefully some with a backline! I’ve a few things lined up for next year and if anyone is happy to offer me an opportunity to play it will be gratefully received. Older and maybe a bit wiser I’ve realised I can dip in and out of genres and styles and enjoy performing for the joy of it. I think I’m well past being a rock star … did I ever want that? Nah! (Mild chuckles ensue). Not that I don’t still have my professional pride.”If a thing’s worth doing” as the saying goes! Oh and I suppose I ought to enter the spirit of the ‘online age’ and post some more content up (I’ll get there)! In essence 2018 will I hope be a year of re-engaging and making new friends on the musical circuit, being amazed by their talents and creativity, continuing to learn more about the ‘craft’ myself and to play and create music in the groove and space I find myself happy to be in. I’ve been too long away from it! This year has been filled with some amazing ‘Lasagne Moments’ for me and I hope yours has too? Let’s hope 2018 brings us more. Sorry for waffling … oh no it’s called blogging isn’ t it. Maybe I am getting the hang of this I.T. thing? This is a new page for a new turn on my musical journey having taken time out to review things and write some new material which is more akin to where I am ‘life-wise’. I’ve had the help of some amazing people in putting together the album and have been humbled by their creativity and generosity. I’m hoping those who know me (and those I’ve yet to meet) will like the new material. Really looking forward to getting out and playing live so see you soon. * available on all major download platforms.